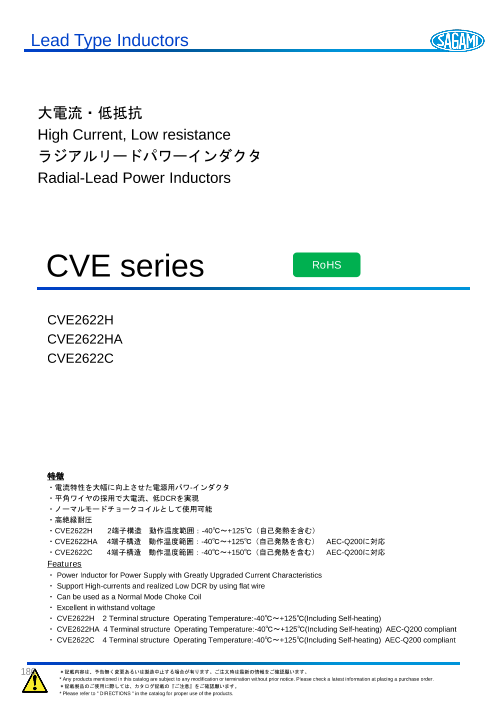 Lead Type Inductors 大電流・低抵抗 High Current, Low resistance ラジアルリードパワーインダクタ Radial-Lead Power Inductors CVE series RoHS CVE2622H CVE2622HA CVE2622C 特徴 ・電流特性を大幅に向上させた電源用パワ-インダクタ ・平角ワイヤの採用で大電流、低DCRを実現 ・ノーマルモードチョークコイルとして使用可能 ・高絶縁耐圧 ・CVE2622H 2端子構造 動作温度範囲：-40℃～+125℃（自己発熱を含む） ・CVE2622HA 4端子構造 動作温度範囲：-40℃～+125℃（自己発熱を含む） AEC-Q200に対応 ・CVE2622C 4端子構造 動作温度範囲：-40℃～+150℃（自己発熱を含む） AEC-Q200に対応 Features ・ Power Inductor for Power Supply with Greatly Upgraded Current Characteristics ・ Support High-currents and realized Low DCR by using flat wire ・ Can be used as a Normal Mode Choke Coil ・ Excellent in withstand voltage ・ CVE2622H 2 Terminal structure Operating Temperature:-40℃～+125℃(Including Self-heating) ・ CVE2622HA 4 Terminal structure Operating Temperature:-40℃～+125℃(Including Self-heating) AEC-Q200 compliant ・ CVE2622C 4 Terminal structure Operating Temperature:-40℃～+125℃(Including Self-heating) AEC-Q200 compliant 186 ＊記載内容は、予告無く変更あるいは製造中止する場合が有ります。ご注文時は最新の情報をご確認願います。 * Any products mentioned in this catalog are subject to any modification or termination without prior notice. Please check a latest information at placing a purchase order. ＊記載製品のご使用に際しては、カタログ記載の『ご注意』をご確認願います。 * Please refer to " DIRECTIONS " in the catalog for proper use of the products.